WHITE FOODS - Don't Let The Nutrition Scare or Confuse You — SIMPLY PETS - HAPPY lives here! Have you heard advice to ‘avoid white foods’? It’s usually followed by how pale food items have less nutrition and are worse for you than their colorful alternatives. This blanket statement was thought up by well meaning people trying to deter others from too much white bread, potato chips, French fries, bagels, sugary cereals and white flour based items. The unfortunate thing is…many great for you foods were caught up in the fuss. You’ve heard that “a rainbow/a spectrum on your plate” is the healthiest way to eat…and white is a color too, so use this article to learn the benefits of white foods as well as a colorful plate! When concentrating on vegetables, chlorophyll, the green pigment that lets plants use photosynthesis is your go-to color. It’s in your broccoli, spinach, kale, asparagus, and lettuce and it’s great for you. Chlorophyll freshens breath, improves blood health and is an excellent source of vitamins. Fruits, squashes, seeds, nuts, roots, and herbs can have chlorophyll OR natural plant pigments like carotenoids (orange related colors) , anthocyanins (purples/blues/dark colors) or lutein (yellows). All these colors are good for you too, with benefits like free radical fighting anti oxidants. But what about these same veggies without the color? You can buy white asparagus, white carrots, white onions, cauliflower of course, has had its leaves tied shut to make it white and alter the taste (brocaflower is its natural open-leafed alternate), white potatoes (the most common potato), and mushrooms (which technically are a fungus, not a vegetable, but they get lumped in there anyway). Are all of these things suddenly on the naughty list because of their lack of color? No way. White asparagus has slightly less calories, but still has protein and fiber. Cauliflower has C, K, protein, thiamin, riboflavin, B6, folate and much more. 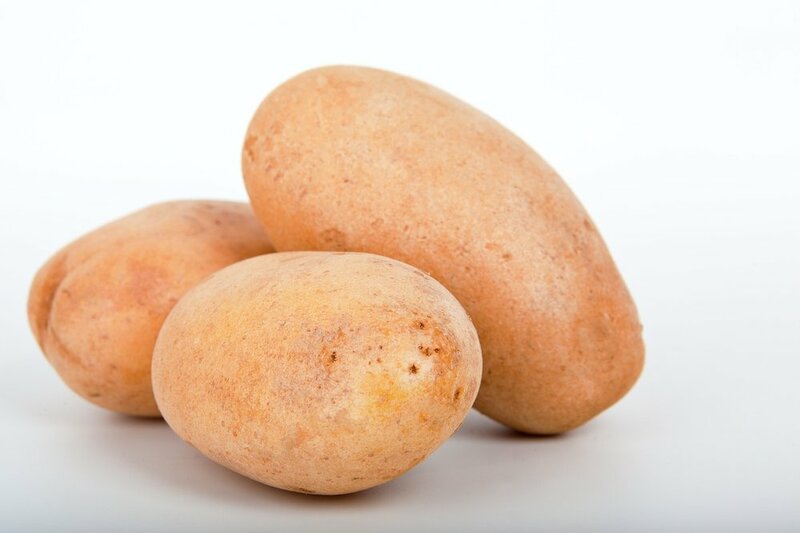 White potatoes have potassium, trace copper, fiber and phosphorus. However, that’s a baked potato, not oily chips or fries. This same discovery of the health benefits of white plants extends to nuts and seeds. For instance, chia seeds come in both white & ‘black’ (they’re actually dark brown and gray) colors, but, as with the vegetables above the white has different nutrition stats, but is still just as good for you. Why one specific seed? It’s known for being white, and also known for not having any flavor. It’s rare that a food lacks taste, but in the case of tiny seeds, it’s an advantage. No flavor means no haters. You can add fiber, complete plant protein, B vitamins, calcium, and trace boron to almost any other food or drink by sprinkling it with seeds. Pair up foods for even more benefits! You’ve heard of mixing the food colors together in a meal to get more benefits, but you’ll do better still if you add nuts and seeds to your fruits and vegetables. Some vitamins are only soluble in healthy fats. That means, your body can’t absorb some nutrients in some vegetables without a healthy fat also present when you eat it. Adding an olive oil dressing to a salad is a good example of this. But no one wants olive oil in their smoothie. Coconuts are white, and their oil is good, but can give items a ‘waxy’ or oily feel sometimes. Again, seeds to the rescue! Sunflower seeds add crunch to salads, chia adds omega 3 healthy oils (just like what’s in fish!) to smoothies & more, flax can be stirred into oatmeal & yogurt to help with the fruit…nuts and seeds are smaller and easier to overlook, but they really can boost the nutrition and variety of flavors on your menu. Just like the outdated advice that ‘eggs have cholesterol and so are best avoided’, it’s time for the white foods lacking nutrition myth to get busted as well. The only white item to focus on eating less of, is processed bleached white flour. But, with all the tasty alternatives and fresh choices available, the decision should be easier. Think you don’t like a veggie? Look up a recipe to eat it in a new way. Raw cauliflower is vastly different from cooked & makes an excellent tabbouleh. White cannellini beans with hominy and a touch of jalepeno with chicken create white chili. Baked potatoes don’t need loads of butter when you know how to mix them up and season them. In this era of easily accessible internet recipes for free, you can find great new ways to try healthy fruits, seeds, nuts and vegetables of all colors. Let white be a color in the rainbow on your plate for better health & more fun menu options! Looking for cool new recipes to try? Choose the easiest way to nutrition first, with the benefits of chia seeds . MySeeds is the only chia that gives you 2 free recipe books so you’ll always know just what to do with your mixed black & white top quality seeds.